3.1. Nearly half of Americans say they have personally experienced the effects of global warming. 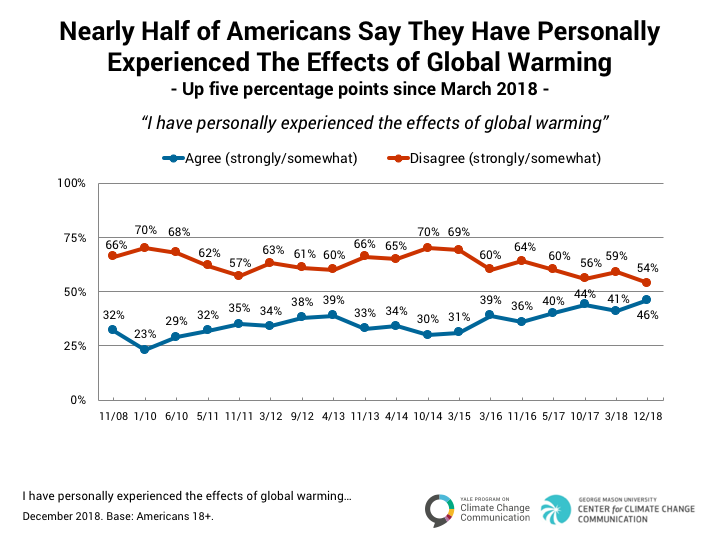 Nearly half of Americans (46%) say they have personally experienced the effects of global warming, while slightly more than half (54%) say they have not. The percentage of Americans who say they have personally experienced the effects of global warming has increased by five percentage points since our previous survey in March 2018, and is at its highest level since our surveys began in 2008. 3.2. Nearly half of Americans think people in the U.S. are being harmed “right now” by global warming. 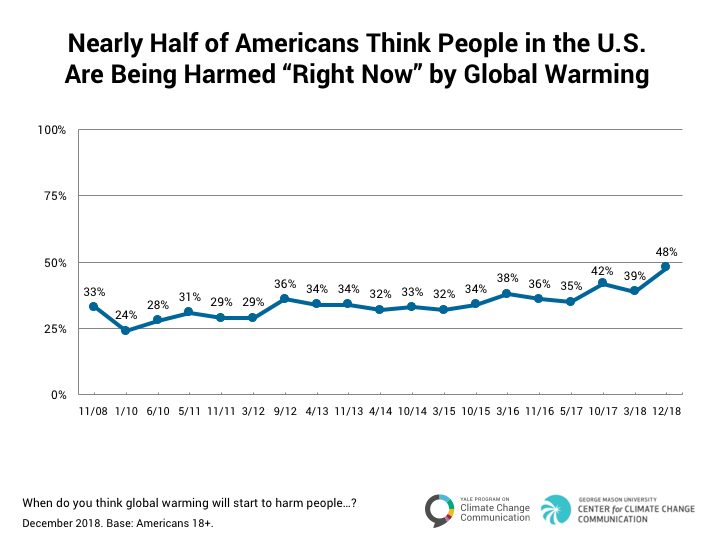 Nearly half of Americans (48%) think people in the U.S. are being harmed by global warming “right now,” the highest level since our surveys began in 2008, and an increase of nine percentage points since our previous survey in March 2018. 3.3. 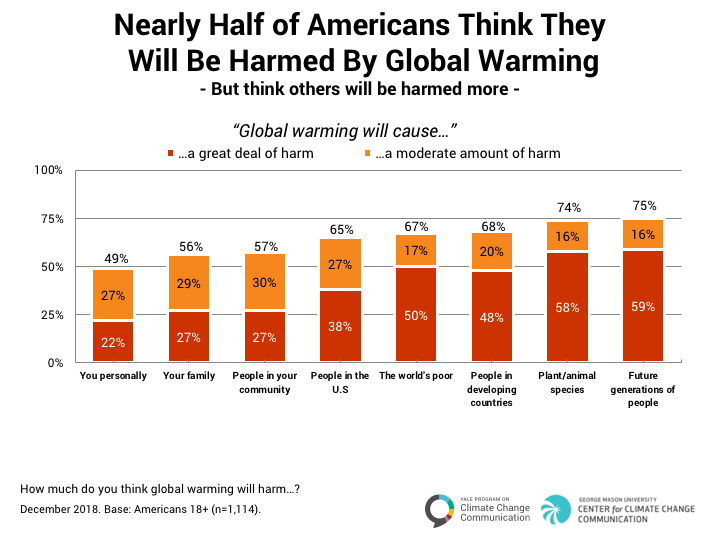 Nearly half of Americans think they will be harmed by global warming, and they think others will be harmed more. Many Americans understand that global warming will cause harm, and that understanding has increased since our previous survey in March 2018. Americans are most likely to think that future generations of people (75%, +4 percentage points since March) and plant and animal species (74%, +3 points) will be harmed a “great deal” or a “moderate amount” by global warming. Majorities also think people in developing countries (68%, +6 percentage points since March), the world’s poor (67%, +4 points), people in the U.S. (65%, +7 points), people in their community (57%, +8 points), and/or their family (56%, +9 points) will be harmed. Nearly half (49%, +7 points) think they themselves will be harmed. Leiserowitz, A., Maibach, E., Rosenthal, S., Kotcher, J., Ballew, M., Goldberg, M., & Gustafson, A. (2018). Climate change in the American mind: December 2018. Yale University and George Mason University. New Haven, CT: Yale Program on Climate Change Communication.